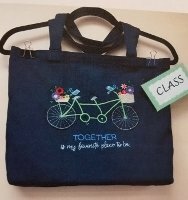 You will be embroidering this cute bicycle design on a tote bag (can be purchased at Friendly Stitches) and will learn how to move your hoop and how to embroider a fringe flower. 5x7, 6x10 or 8x12 Hoop. Design is included in class fee. Click for class sign-up form.